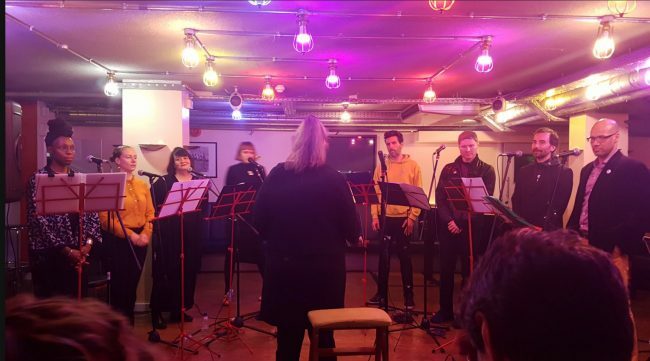 On the evening of March 8th, Jenni Roditi and the Improvisers’ Choir performed in the second of two concerts at Club Inégales in Euston, London. The concert was the culmination of a two day Open University conference International Women And/In Musical Leadership. Coinciding with International Women’s Day, the event focussed on what still remains a largely male-dominated sector of musical activity. Jenni was one of two keynote speakers at the conference and as a fitting finalé, Jenni and her choir were to be the sole act at the Club, curated by fellow musical pioneer Peter Wiegold. The evening opened with a panel comprising Jenni, Peter, two members of the choir and the conference director Helen Minors, who chaired. Responding to Helen’s questions each gave their unique perspectives from their various roles in the world of conducted improvisation. Jenni and Peter initiated the discussion with their insights as directors of their respective projects. I was impressed by Peter’s view on collaboration as working with the “person” not just the instrumentalist. To me this spoke of honouring a person’s deeper voice; of what they had to offer, not just from their technique and training but through their tradition, taste, personality, musical and life experience. It is a more holistic view of a person’s musical capacities, drawing from the whole person and not just their immediately apparent musical mastery. This is certainly evident in his recent Third Orchestra project in which 22 musicians from around the world were brought together, each enthusiastically encouraged to add their unique voices to the ensemble sound. Jenni spoke of how only fairly recently, we have had the “privilege to be able to experience music from almost any genre, culture or time”. This ability is literally at our fingertips 24 hours a day through our increasingly networked technology. The potential for influence, cross- pollination and proliferation of creative ideas represents a vast broadening of our musical horizons. Jenni and Peter’s projects have both of the above themes at their core and are fundamental to what makes their musical outputs so rich and their continually evolving possibilities so exciting. The singers themselves were asked about identity and authenticity from their roles as “persons” or voices within the ensemble. They spoke of being “present but not self conscious”, that is, being in the presence of the sound; to having their “ears open” and adding what the music needs or enhancing what is there. This kind of open listening or unbarred reception reveals an essential principle of how the group works. Moreover, the performer can have their say and contribute significantly more to the music than what is usual, for example, by a performer of composed music. This input concerns actual material, as well as interpretation or expression, and hints at a more dynamically democratic creative process. The decision of what to add comes from the intuition, ideas, invention and discrimination of the performer, drawing from all elements of their musical and personal history and experience. Delving deeper into the question of authenticity and this person-centred approach, the question of “is this art or therapy?” was posed to the panel. Of course, Jenni’s choir did indeed grow partly out of her Vocal Tai Chi (VTC) workshops, coupled with the conducted improvised work of Peter. 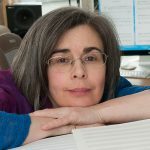 Jenni was so enamoured by the outpourings of participants of VTC, as “sometimes having the character and quality of a Berio Sequenza”, that the idea of performance persistently arose. However, to take VTC in its raw form to an audience would be “irresponsible”, as she put it. The volatile and unbridled, sometimes cathartic and deeply personal torrents that sprang from each member might be too much for both audience and contributor. Jenni knew that structure was needed and this was where Peter’s conducted improvisation came in. When Peter was asked the same question concerning art and therapy, coming from the other side of the platform into which Jenni was peering, Peter could see his person-centred approach as a therapeutic practice in itself: “Music emerges from the emotional condition of the person” and his conviction that the musical voice is the person’s voice, speaks elegantly of such. And so, after this revelatory look into the processes, practices and principals of those involved, the choir took to the stage. This concert would see the choir face a new challenge, however. With the advent of the release of TIC’s first EP entitled Landmass, Jenni decided to recreate some of the pieces from the recording. Being an improvised choir and the EP consisting of completely improvised material, this was a new endeavour for the group. The challenge was well met by all members and each of the pre-improvised pieces gave us a new insight into the talent and adeptness of each singer. Following are some of my responses to the evenings pre-improvised and completely improvised works. An inaugural declamatory phrase was delivered, the choir answered in echo and a theme evolved. Beneath, a bass pulse nudged in generous nurture. The collective voices wound around the theme, revolving around its core, wreathing it in voluptuous veneers of harmony. Multiple ethnicities of indeterminate origin chanted their inventions of nascent traditions. They met in greeting and in complete consensus; agreeing without sameness, equality without conformity. Birds call, and we descend to a drone. Upon which a wall is made, vowels are laid with mortar of consonant cohesion. Ululation rises, climbs and falls whilst words sing and speak. Intensity builds, collectively then subsides… words continue. A chorus unfolds from a question of “who wrote the chorus the dawn birds sing?” And another wall is laid, curving its way among the pieces on the board: A stage of players, under the branches, where the birds return and sing the song to sleep. A person speaks and personalities meet, allowing each other in welcome embrace. And the embrace is “song”! A success of sets, communing in diversity, join each other and try each other out; More than mere accommodation, they support and sustain in balanced differentiation of enhanced embrace. Spurring and urging onwards, the whole embolden’s the one. Each filament is fortified by the collective and fostered to thrive in the communal mass of encouraged embrace.